The "Demosion Sema", the public cemetery of the city, extended just outside the Dipylon gate. The graves were constructed along the sides of the road which became very wide (up to 40 m.) outside the walls. 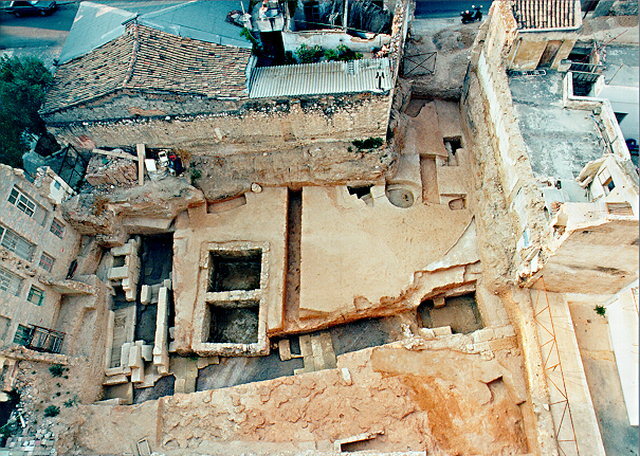 A part of the "Demosion Sema" cemetery has been brought to light in 1997, during a rescue excavation. The Public Sepulchre (Demosion Sema) was a cemetery of the ancient city of Athens which came into existence along the road which ran from the Dipylon to the Academy, covering a distance of aproximately 1,500 m. At its beginning the width was as much as 40 m. Apart from scattered references in the ancient sources, there is the extensive description of Pausanias (I, 29, 2-16) of the 2nd century A.D. Here were the graves of public figures such as Solon, the tyrant slayers, Kleisthenes, the democratic leader Ephialtes, Perikles, the rhetoricians Euboulos and Lykourgos, the philosophers Zenon and Chrysippos, and generals such as Phormion, Thrasyboulos and Chabrias. In addition there were so many common graves (polyandria) of those who had fallen in war that the Demosion Sema gave the impression of being a military cemetery. The use of the area as a cemetery, with burials at public expense, is in evidence from the time of Solon. The systematic common burial at public expense of those fallen in war appears to have been regular practice from the time of Kimon. Both common burials and burials of public figures continue in this place at least until the 3rd century B.C. During the official ceremony of burial, honours of immortality were given to the heroes fallen in war whose bones had been brought to Athens from the field of battle. Games were held, a funeral speech was delivered and the state undertook the care of their families. Stelai were erected over the graves with the names of the fallen according to tribe (phylai). Despite numerous excavations in the area during the past 40 years, and the location of many sections of the road, none of the important burial monuments had been found other than the few included in the archaeological site of the Kerameikos. The excavation revealed four burial monuments - polyandria of the 5th century B.C. Their form, their underground character, and the position of the site immediately east of an identified section of the ancient road makes their identification certain. This is supported by the evidence of the ancient sources, especially Thucydides (II, 34, I-7) who describes the burial ceremony of the first who fell In the Peloponnesian War, as the fulfilling of the "law of their forefathers" ("patrios nomos"). The buildings are of depository type ("theke") and are made of poros (limestone). In plan they are long and narrow and in height two courses covered over by slabs, built carefully of large blocks founded on a layer of slabs, in trenches laid out as �. In one of the polyandria burned bones were found in situ together with votive vases with no trace of burning, thus showing that offerings were made after the cremation of the dead. In mixed layers were found the burned bones of well built men and pottery of excellent quality some of which can be attributed to circles of known painters of the classical period, such as the Achilles Painter, the Tymbos Painter, the Kleophon Painter and so on. The pottery recovered from undisturbed levels dates the monument in the third quarter of the 5th century B.C. This span of time includes the last period of manoeuvering which led, with the apogee of Athenian sovereignty, to the Peloponnesian War, and specifically to the first years of that war. The discovery is of the greatest importance for our knowledge of topography, history and in particular the funerary architecture and pottery of Athens in the classical period. Expropriation proceedings have already been initiated by the Ministry of Culture for the adjacent lots so that the monuments can be revealed in their entirety. Plans have been made to extend this exploration in order to link the area with the Dipylon and to include it in the Unification of Archaeological Sites of Athens as drawn.